Alison asked about aquiring a man's professional wardrobe for less. Any tips? As a wife, I've enjoyed helping him look his best on our budget. He's built a professional wardrobe by picking up 1 to 2 suits per year. We've found Nordstrom in a rural Alabama junk store and glen plaid at the Big & Tall shop's annual clearance sale. The real challenge is always fit. Many thrift stores do not allow returns or exchanges. He's found so many wonderful clothes that he no longer minds popping in for a look. Check the inner breast pockets for a tiny size tag; 50% of the time I can find the size. Even then, the legs & arms may have been shortened. You can carry a tape measure if that helps. brands like Hart, Shaffner & Marx, Brooks Brothers, Hickey-Freeman. Otherwise, the best deals can be found at department store clearance sales (we like Dillard's for Big and Tall shirts) and discount stores like Steinmart. Where do you find professional dress for less? Y'all always have better insight than I do! What a helpful post. We also get name brand shirts from warehouse stores but we need an easy to find size. Thanks for this post! 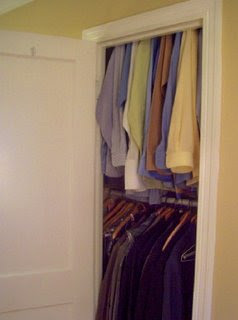 It seems like this is the tricky wardrobe area for our family, too. I want to add that putting the word out is always good, too. My Mom just called me the other day asking my hubby's jacket size as my father has a suit he recently purchased for and can no longer fit (he's lost a lot of weight recently) Also, about a year ago a friend switched jobs and no longer has to wear a tie every day. My hubby inherited a wealth of sharp, nice looking, name-brand ties. Another place to try for suits is Kohl's. But, only when their suit separates are discounted deeply and when you can take off an additional 20-30% discount when you use your Kohl's card. Their range of sizes aren't the best, but you can order online for a minimal price and I've always found returns to be very easy. My husband is 6 foot 8, so finding things in a thrift store is very hit or miss. Down here in SW Florida, Dillards runs 75% off their clearance twice a year. So we stock up for the next six months. Thank you for such a wonderful site. Fortunately, my husband does not need to wear suits for work, but he does need to be 'business casual,' and he's hard on clothes, so Kohl's, like a previous poster mentioned, has worked best for us. There is a certain type of pant that has worked out well for him, so when it's on sale plus I have a coupon for an extra amount off, I stock up for him. Same with shirts. Meredith, Do you have "tips for ties"? Small print, certain color, colors to avoid, patterns to avoid? I know, I know, forget the Looney Tunes, of course! :) Favorite brands? Thanks so much! P.S. Maybe you could post a picture of favorite ties? great tip "check for shine". I'm planning an upcoming thrift store hunt in a pricey prep school region, now that my son is in men's sizes. A friend in the university system in Boston has jaw-dropping tales about the quality goods their students leave behind. And, Men, please don't wear a tie that is too short (or, ladies don't let them!). It should touch your belt buckle. There are extra long ties for the tall guys. A good-looking outfit can be ruined by a gap of shirt between the end of the tie and the belt. Well, my parents are probably the #1 way we dress my hubby! My dad loves a good bargain, so they're always picking up clothes for Steven. We discovered last year when Steven had to be a pall bearer at a funeral that his suits no longer fit (and they were a bit out of style), and his sports coat had acquired a moth hole. He made do for the funeral, as there just wasn't time to prepare otherwise. Then we went suit shopping. We've found Macy's to be a great place for bargain deals on men's dress clothes. Not only do they run really fabulous sales, but there are often 15% and 20%-off coupons in the newspaper. Those coupons can be used with sale items. We wound up finding a designer sports coat and coordinating designer wool pants for a grand total of $125. I realize that may not sound like a bargain to those who thrift shop, but the original price for everything would have been around $500. S & K has the BEST shirts. They do not ever need ironing, just hang them right out of the dryer. They cost more, but last much much longer. They don't compare to anything else. Find the cut and size that fits and look on Ebay for the same. Cost per use, this is the best kind of shirt, hands down. My frugal friends agree. I shop consignment all of the time. I have to watch for items that are not for my age bracket and I make sure that the pieces are more classic than trendy. My best bet recently has been sales at department stores, which have come close to thrift prices. Steinmart, TJ Maxx and Ross are also good. We have also had iffy luck shopping thrift store for suits and dress shirts, although we only have one or two reasonably priced thrift stores available to us. Ross has been our favorite so far, along with sales at Herberger's and other dept. stores. Mrs. L., Meredith probably has more experience dressing husbands than I do, but Hubs and I did recently go tie shopping. He tells me that red and yellow ties (not both colors in one tie!) are still the way to go to blend in professionally. We branched out a little bit and bought some ties that complement his skin color. His main suit is pinstriped so we steered more towards solids and subtle patterns. I think we'd go with a red, yellow, or neutral-colored tie if we wanted to buy a patterned tie. If the color of the tie is more unusual, it seems like solids might be safer? I've also found that a good grey tie with a subtle pattern will go with pretty much anything. Hope this helps! There's a nicer consignment shop near the seminary that we've used before to sell my husband's old suit. They have a "big" selection but finding the right SIZE is a problem. I would LOVE LOVE a post on how to dress our husbands - matching ties, finding a suit, etc.!!!!! Thanks everyone, these tips will really be helpful (I'm the Alison who asked for the topic). The tip on size tags will really help me and it's reassuring to know that I'm not the only one who relies more on clearance sales & discounters than thrift stores for this category. My tip is that quality pants are made to be "let out" so you can increase the waist size by as much as two inches. In Sacramento, CA that costs about $18. My husband wears extra long dress shirts and prefers JC Penny brand, we used to live near a thrift store that got donated men's dress shirts from dry cleaners all the time and I never had a problem finding them, since we have moved I've not had as much luck. My husband is a professor in a scientific field. He and his colleagues pretty much live in business casual (sometimes adding a tie); when he wears a jacket, it's a lab coat! I have had phenomenal luck finding high-quality sportshirts at the Salvation Army in a larger town nearby. Some recent finds include nice shirts by Banana Republic, Tommy, Chaps, Eddie Bauer, and Woolrich--all in EUC to NWOT condition. I bring measurements and/or one of his favorite shirts along when I shop. He often takes a tall size, but I find that many nicer brands' regular sizes are just as long in the sleeves/body as other brands' tall sizes. Most of his favorite shirts these days are secondhand. As for pants, he strongly prefers LL Bean, and his size is somewhat unusual--so I shop ahead during sales when possible, check the Bean outlet (one state over!) when we are driving that way, and try to plan ahead so he is never without something nice to wear. I have a couple of tips - the Hawkeye isn't a big man, so I often have lots of luck finding very nice stuff at thrift - that other guys have 'grown out of' and given away. With dress shirts, they often shrink in the sleeves and sometimes the neck when they have been laundered professionally, so he can often wear a larger shirt size just fine. Actually, his normal shirt size often is too short on a second-hand shirt. The tip given above about bringing a tape measure was a very good one. Also be sure to check very closely for stains and broken zippers / missing buttons, etc. on a second-hand purchase. Happy thrifting! -shopping the sale racks at tjmaxx... during one lunch break he met me there where my criteria was very strict: no shirts over $10, no pants over $15. when we left he had 6 shirts (2 nice polos, 2 nice button short sleeve & 2 solid button long sleeve) and 2 pairs of nice dress slacks for about $70. A great bargain day. For business casual we like Land's End. I'm willing to pay more for quality that will last several years and LE does just that. For when second hand isn't an option, I recommend JcPenney and buying their Stafford line. We run with a bit of a Yuppie crowd-- most of whom haven't set foot in JCP in years. You'd never tell by looking at my husband that his suit cost a fraction of what his friends wear. My husband is 6 foot 5 inches and has very long arms. The trouble is he is a large tall most big and tall are too big they are XL and up. I never find his size at thrift stores or garage sales I have just given up. I love Dillard's sales. The end of summer and end of winter ones are great. I also find a lot at Llbean and Eddie Bauer online clearance. They really mark their stuff down especially end of season. Also Lands End outlet has good stuff. My husband is a bank president and has to interview people often. He always checks the way a man is dressed. He looks to see if their shoes are clean and in good repair, if a man takes off his suit jacket and is wearing a short sleeve shirt it looks terrible. Button down shirts should ALWAYS be long sleeve. Ties need to be not too short and not too long. Tie tacks are tacky (pun not intended) in a professional setting. Also it is distracting in a professional setting for men to wear jewelry other than a wedding band and a watch. Cologne should be worn lightly or not at all. Hubs never wears cologne. These things may seem petty but you would be surprised how many men lose a job opportunity because of unprofessional dress. If you live near a Belk they have their annual Golden Opportunity Sale. We have gotten suits for Hubs there for a steal. My husband has found tall suits from Penney's which work well for him. They put them on sale for a reasonable prices. Walked in Target and Walmart and they have INSANE prices on their men's section - from slacks to shirts, etc. Goodwill here is wonderful- Lots of tall men who shop at Nordy's end up just giving away half their closet to Goodwill and we catch most items for cheap! My hubby must wear dress pants/shirt/tie everyday. He is 6'3" and wears a Large Tall shirt, a 16.5x36 dress shirt, 36" inseam pants, and a 42L suit, all of which are nearly impossible to find on consignment or at discount stores (ie TJMaxx, etc) though I do find something every once in a great while. He has TONS of clothes from LandsEnd overstocks. My mom has bought him a dress shirt and wool pants from there every year for the last 8 Christmases. They have lasted incredibly well; I can't see any difference between last year's gift and the oldest set. Plus they stand behind their work; I've called on a few items that they've taken care of right away, not matter how old. Putting dress clothes on the Christmas list has been one of our methods of keeping down professional clothing costs. I've also had some good luck with JCPenney's tall section to supplement the Christmas gifts. Sometimes I have to hunt for stuff that's not too 'old-man-ish' or 'teenage-trendy.' But usually there are a few selections that are good for a 30-something professional. Their end-of-the-year clearance is great, and he inevitably gets a giftcard to JCP which is nice. I also look there for his casual clothes, as well as Gap online and Eddie Bauer (which sometimes even has talls in the store as well as the website!). Good Luck!! I agree with Grace: we request professional clothes for gifts. We also always check out Lands End overstocks. Their stuff is incredibly good quality! I do find things at our Salvation Army, but men tend to wear out their clothes before they get rid of them, so I have to be careful. I really enjoy dressing my husband! I pay careful attention to what he likes - he's an architect and has definite opinions on style, but he doesn't have time to shop the way I do. My husband is a professor and usually wears a Notre Dame sweatshirt over a button down shirt every day. But it was an interesting challenge to frugally outfit him for the transition from grad student to professor! We have found most of his button down shirts and pants 70%off (with addtl 30% off day) at Dillards or at JC Penney's major markdown sales. Most of our clothes now come from Dillards because of the awesome clearance sales!